Stelton's Simply Espresso Portable Coffee Maker | OhGizmo! Whether you find yourself deep in the woods on a camping excursion or at 30,000 feet on a long-haul flight you’ll never have to go without a cup of freshly brewed espresso again thanks to Stelton. Their Simply Espresso is a battery-powered thermos-sized contraption that will brew a cup of espresso no matter where you are. Just add water and one of the espresso packs, push the button and in no time flat you’ll have your caffeine fix. No pricing info at the moment, but it will supposedly be available sometime this Fall. 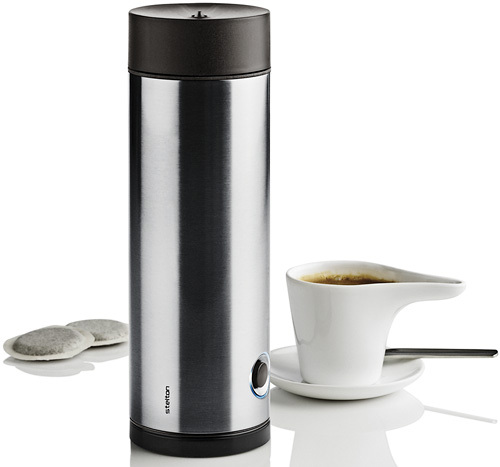 This coffee maker looks like a simple coffee tumbler and at first look you will never notice that this is a portable coffee maker.